David Langworthy, CEO and Founder of Disaster Aid Australia (DAA) calls himself a mad man. And he is proud to be one - he believes that only mad men dare tread on paths others would not. I hadn’t quite realized what we were taking on when we, the Rotary Club of Thimphu, invited David to visit Bhutan, in gratitude for the most generous gift of 10 SkyHydrant water filter systems for our school children. In the days that followed his arrival in Bhutan - the enormity of what we were taking on hit me - having spent 5 days with the man who is set on a colossal dream - Safe Water for Every Child on this planet. He believes that safe water is the most basic human right. He is embarking on a global movement that espouses safe water as a Basic Human Right. And he wants to start with Bhutan. In the coming months and years, he wants to turn Bhutan into a model country where he will test-launch his vision - by delivering safe water to every school children in the country. 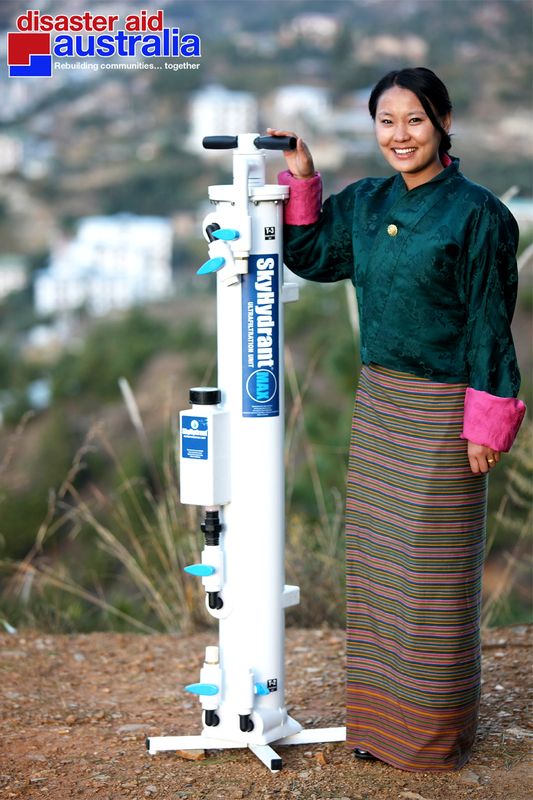 At the request of the Education Minister Lyonpo Norbu Wangchuk, David has agreed to initiate the program by first working on the delivery of the requested 60 SkyHydrant filters - which he promptly upped to 120 units. 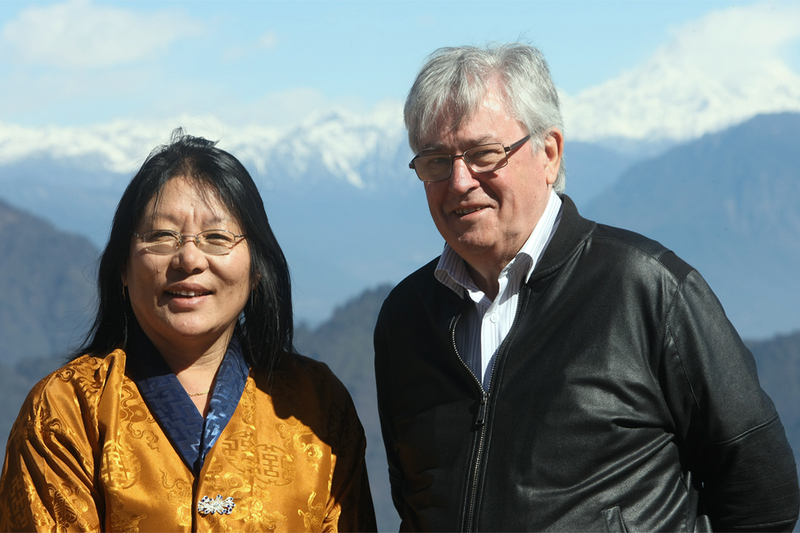 Based on the input to be provided by the Ministry of Education, the Rotary Club of Thimphu will submit to him a proposal - a general outline of where and how his vision for Bhutan will be played out. Simultaneously, he will be presenting his vision at the global level, during one of the seven Breakout Sessions of the Rotary International Convention in Toronto this June, where anywhere from 20,000 - 30,000 Rotarians will congregate. He is sponsoring a number of speakers from the Region, to share their experiences in safe water delivery, at the Toronto Convention. Bhutan and the Rotary Club of Thimphu will be represented in that Breakout Session in Toronto. He thinks that what he will achieve in Bhutan will be the first baby steps that will ultimately lead to the realization of his final objective - of delivering safe water to every child on this planet. He says that if Rotary has been able to single handedly eradicate Polio, there is no reason why the organization cannot achieve the same level of success in delivering safe water to every child on this earth. By any measure, what David is embarking on is nothing short of a revolution that could gain momentum at a global scale, and alter lives. And yet, I am amazed by the simplicity with which he outlines his monumental dreams - akin to a Buddhist monk on his ancient ritualistic walk to gather alms - calm, serene and unwavering. Fate, destiny, karma …. What can be said of them? They collide and clash and the synthesis can result in some unexpected journeys and happenstance. The Rotarian K K Looi from Malaysia who gave a 20 minutes talk on the subject of SkyHydrant during the Rotary Conference early last year in Thimphu, could not have imagined in his wildest dreams that his talk would end up being pivotal in the delivery of safe water to every child in this country and, eventually, the whole world. I suppose it was destined - a destiny that is most welcome! NOTE: In less than 20 hours, this post rose to the top of the ladder as the most popular post of the week. Look to the column "Popular Posts" on the left. Probably the most anticipated gift for the most humble school children and teachers all across the rural pocket of the country. I wish CEO and the team safe journey back home and Rotary club of thimphu for doing the great work and inititative for the lives of thousands of innocent children. The work done by the Rotary Club is remarkable and exemplary. It shows that assistance can be delivered so much more effectively without and beyond cost hogging UN agencies. This is also a wake up call for formal international donors, especially the UN system, that supports a host of money making individuals whose upkeep could "poverty alleviate" an entire village several times over. The irony is that while we are ensconsced in spreading the GNH philosophy around the world, we still continue to build schools without proper water supplies, both in terms of quantity and quality. Water purification and filtration systems barely make it on the budget papers. Our planners fail to see that clean and safe water means healthy children leading to savings in health delivery costs. The Rotary Club has shown the way and the MoE must start to incorporate such systems in all its schools. If you can build a school that costs 10 crores, you can surely afford a water filtration system.